After lots of research and thinking I decided to go with the Nikon P-223 3-9x40. Everyone seems to love em that has em. Should be here any day. Then I get to really see what the Veprnov can do! Cool. Get some pics up when you get some satisfactory results! Soon as it arrives I'll use a bore laser sight to get it set up that I already borrowed from a buddy of mine. Then I just gotta get to the range to dial it in. I got a feeling that I can get sub MOA. I look forward to it Liberty! Im going to pick up some glass for my 5.45, but havent decided on what kind yet. This is what I put on my .308. 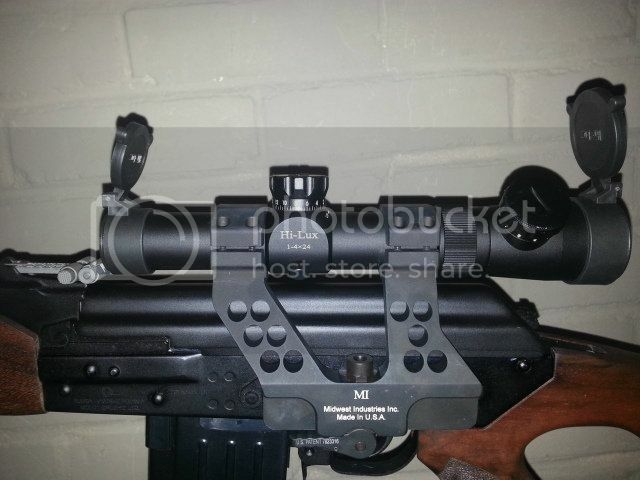 Leatherwood 1-4 CMR in Midwest Industries 30mm scope mount (MI-AK30SM). Sits close to rear sights now but doesn't interfere with sight picture. I will adjust it back a bit when I change the stock out. Just got it mounted and haven't sighted it in yet. I should have a pic to post later in the week of my new setup. My scope arrived! Weather here is raining, possble local flooding. I'll have to wait for the range to dry up before sighting her in. Sighted the Veprnov in today at 100 yards. Windy, but sunny so I just had to go shoot. Using reloads mixed head stamp. Shooting off sand bags I was able to get 1 1/2 inch groups. I think with less wind I can tighten it up to an inch or better. I was hoping for MOA or better, but the wind might have been too much to expect that. So far I'm happy with the set up and accuracy. WIll post more results next time I get out. Hopefully in the next couple of weeks. Thats awsome Liberty. 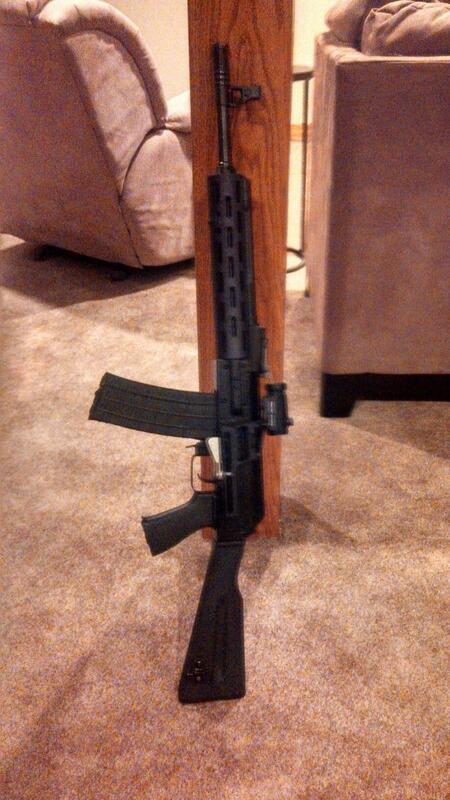 Im awaiting funds to scope my Vepr 5.45. Ive got a stash of 70 gr. wolf that seems to be impossible to get ahold of at the moment. Im eager to see how she does with some good glass and that load and the Hornady.